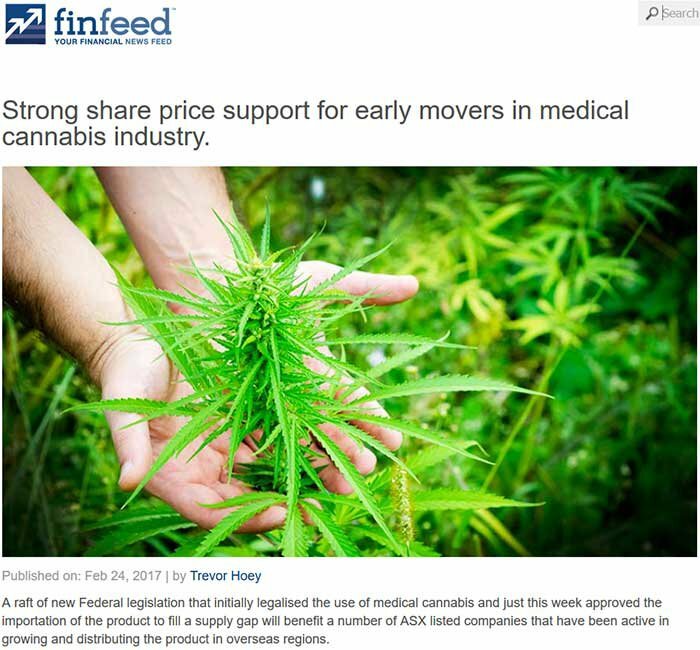 ...which is why many investors have raised their binoculars on the lookout for bright medical cannabis companies at an early stage of development. One medical cannabis company, run by a former big-pharma executive, has joined the fray and today listed on the ASX via an oversubscribed IPO raising $5M, having formed a company currently worth around $11M. We have previously brought you several plays focusing on medical cannabis, but this latest one has a very expansive feel about it. Today’s company is not only targeting its CBD-based therapeutic products to human customers (CBD is Cannabidiol, a non-psychoactive cannabinoid with a vast therapeutic range), it’s also pitching its products at animals – including dogs and horses. However, it is still an early stage play and if considering this stock for your portfolio apply caution to your investment decision and seek professional financial advice. Many chronic conditions in pets, such as behavioural disorders, pain, seizures, and inflammation remain poorly treated by current therapies and the number of treatment options are limited. Those which are available may not have been developed specifically for animal health and often have severe adverse effects. Just as medical cannabis can be used to treat a range of ailments in humans, a growing body of empirical evidence from animal studies as well as extensive in vitro research actually indicate that our furry friends could also benefit from therapies derived from the cannabis and hemp plants. the innovative proprietary cutting-edge oral dissolvable dosage form and enteric-coated tablets based on the Syloid® XDP Silica developed by another German partner in Glatt Pharmaceuticals. This company has also recently acquired Hemp-Industries from Slovakia to help it generate early revenues and source part of the key ingredients necessary for the development and commercialization of its therapeutic products on a large commercial scale. The company has taken a straightforward, low regulatory barrier path to market which can help it reduce R&D costs, and commercialise its products sooner. When you consider what this company will be doing in the near term now that its wheels have hit the ASX, it could have a big future. Where the current crop of ASX listed MC companies are focused on demand and supply for recreation and medical use, this company’s difference will be in its ability to develop products for the nutraceutical market, both for the human health segment and the veterinary segment. Research conducted by marketsandmarkets.com predicts the global nutraceutical market to reach US$204.80BN between 2015 and 2020. It is also estimated that the global cannabis market will be US$50BN in the US and US$200BN globally by 2018. 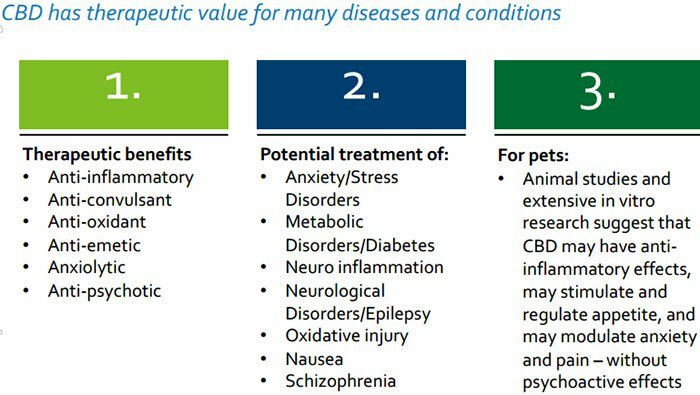 These are two very lucrative market segments that this company wants to tap into and it feels the key catalysts in the growth of these industries is the use of non-synthetic, botanic full-plant derived therapeutics for a growing and aging human and pet population. It is anticipated that nutraceuticals will also be bought for prevention of symptoms and diseases as part of individual consumers’ health regimens. This company intends to provide safe, CBD-rich therapeutic products and treatments developed and manufactured with GMP ( Good Manufacturing Practice ) standards . The products will be unique in composition, standardised in formulation and dose, and administered by proprietary delivery technologies enhancing bioavailability and absorption – which will fulfil the necessary requirements for efficacy, safety, highest quality, and consistency. This company intends to create and lead a new paradigm in the field of nutraceutical therapeutics via the emerging industry of medical cannabis, which is ready to create new commercial realities of its own. 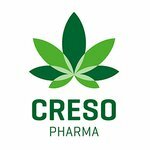 Creso Pharma (ASX:CPH) is a fresh-faced ASX entrant having only come into existence less than a year ago in November 2015. The case for CPH is built on the sum of fusing big pharma management with medical cannabis experts, first-mover advantage and a unique product offering portfolio that aims to generate revenues within the first 12 months. CPH has already entered into exclusive worldwide agreements with a number of companies to develop their proprietary technologies to create cannabis-based therapeutic products. Successful delivery of the innovative products based on these technologies over the coming months is likely to propel CPH higher in the valuation stakes as medical cannabis continues to make headway as a burgeoning new market. One of the aces up its sleeve is the fact that CPH will be marketing products not only at humans but also for animals. Animals, just like humans, have an endocannabinoid system which these therapies will target. This system is a unique regulatory control system in all vertebrates which is involved in the regulation of numerous physiological processes and whose main function is to maintain a stable and balanced internal environment despite changes in the external environment. Animals will benefit from supplementation with CBD, in a similar way as humans do; we would give our beloved pets supplements to help with vitamin D or B12 deficiency, and CPH are intent on marketing CBD for pets in a similar fashion. The animal market offers attractive commercial opportunities at a global level. This is particularly poignant in Europe which has significant pet ownership and where pet health responsibility is well developed. People want their pets to be as healthy as they are, so as medical cannabis continues to prove its doubters wrong, it could be animals to demonstrate beyond all reasonable doubt that medical cannabis has a place for treating many illnesses and diseases. Statistics show that 41% of pet owners have considered or tried alternative therapies including nutritional supplements (29%), herbal remedies (7%) and homeopathy (4%) when treating their pet. Veterinary care, which includes prescription drugs, accounted for $14.4BN in the US in 2014, up by more than 50% since 2006. ...and CPH is putting itself at the forefront of this intriguing market sub-niche. However, how much of this market niche CPH is able to capture remains to be seen, so do your own research and take into account all available information with regard to this stock before making an investment decision. Capturing an early position in the veterinary care market could be a masterstroke move by CPH, as this could open the door to early revenues and cash flow. Just a few years ago, anything cannabis-related was deemed illegal, dangerous and utopian. Now, medical cannabis is seen as a potential source of relief for overburdened public health budgets and patients suffering from all sorts of illnesses ranging from cancer to psoriasis and various central nervous system ailments. The company aims to break into the undersupplied vet market, which could result in a first mover advantage if successfully executed. However, there are also human therapeutic products being hatched by CPH. One thing you may have noticed in recent years, is that there is an overwhelming consumer demand for safer and more effective methods of doing the same old things. In any industry you look – whether its technology or biotech — the clear common denominator for strong commercial ideas is the premise of improving efficiency and reducing waste. In Biotech, medical cannabis is a perfect symbol for this cleaner and less wasteful mentality; and CPH wants to step away from the artificial-sounding ‘pharmaceutical’ moniker, and enter the botanic based ‘nutraceutical’ space with its finished products. The main difference between pharmaceuticals and nutraceuticals is explained in the name. The former offers lab developed synthetic-based products, while the latter provides botanically- derived nutritional supplements. Nutraceuticals require a very different regulatory approval to make it onto the store shelf, much lighter and streamlined as compared to pharmaceuticals that usually require 10+ years of clinical trials, doctor’s prescription, and offer hefty price tags. Like pharmaceuticals, however, nutraceuticals is a multi-billion-dollar industry. In the nutritional market, single products can become “blockbusters” in terms of sales, and household names across the world. In other words, think fish-oil extract, omega 3 supplements and vitamin C tablets. In recent years, the fastest growing market segment for therapeutic products has been the Nutraceutical and Food Supplement niches. These products are nutritional supplements that provide health benefits, and can be packaged as isolated nutrients, dietary supplements, herbal products, or specific diets and processed food and beverages. The total global nutraceuticals market is expected to reach $204.8BN by 2017 and is expected to reach around US$385BN by 2020, at a CAGR of 7.5% from 2016 to 2021, spurred primarily by dietary supplements. There is a good chance that once the healthier and less intrusive methods of healing facilitated by medicinal cannabis and hemp are explored and developed, it will help to generate an increasingly larger addressable audience for CPH as people switch from artificial synthetic chemical compounds over to natural botanically-driven remedies, including from the cannabis and hemp plants. Those are juicy numbers that CPH wants to tap into post ASX-listing — and we think the tandem growth of people’s desire for more natural technologies and therapies combined with CPH’s thrive for standardisation and high quality, is a commercial match made in heaven. In other words, CPH is hoping to develop something more akin to high impact, billion dollar sophisticated and innovative dietary supplements easily accessible by large numbers of consumers. This is opposed to high-impact drugs of synthetic origin (and by prescription only) that billion- dollar-capped companies like Pfizer are developing. This straightforward path to market will help CPH save a huge lump of expensive R&D costs, and will likely mean its therapeutic products are being commercialised far sooner for both humans and pets. OK, let’s take a look at the wares CPH is prepping for the public (and their pets). First on the list is BioLingus , with whom CPH has entered into an exclusive worldwide collaboration and license agreement covering all phytocannabinoid mixes. BioLingus technology has been tested in both animal and human studies and has proven to match subcutaneous injections in its effectiveness for delivering compounds into the blood stream. In other words, the same drug can be given in an oral form without the anguish of injections. Its other major advantages are on one hand the sublingual aspect of this delivery system which will allow to increase the bioavailability and absorption of the phytocannabinoids into the blood stream, and on the other hand its scalability and ability to provide a low-cost product with an extended shelf life. BioLingus is the result of more than a decade of research. As a validation of its efforts, BioLingus has been selected as the winner of the 2016 AWARD in the category ‘Most Innovative Biotech Company’ by the European CEO magazine. The awards will be presented during the world-famous 2017 World Economic Forum Meeting (WEF) in Davos Switzerland. CPH’s collaboration and license agreement with BioLingus clearly gives it an award winning platform from which to launch its products. CPH has entered into a binding Letter of Intent with INNutriGEL, who developed INNutri Soft GumsTM, a novel way of delivering drugs into the body via a technology using a patented protected Low Temperature Mogul technology ( LTM ). The dissolvable texture combines a flavoured elastic outer shell made of starch and a liquid core centre, thereby allowing an excellent buccal method of drug delivery. The INNutri technology carries unique advantages that largely supersede other forms of oral delivery capsules or pills. This is done mainly by taking advantage of the buccal absorption which allows the substances (in this case the CBD and the other phytonutrients) to be immediately taken into the blood stream via the rich blood vessel structure in the mouth (instead of going through the GI system) therefore increasing bioavailability and absorption. But also, the product is fully vegetarian (non- animal derived, vs the usual Gelatin), and much easier to ingest and therefore well suited for both geriatric and paediatric populations. These little rascals are even “Vegan, Halal and Kosher attuned”. Under the terms of the Binding Letter of Intent, INNutriGEL and CPH will conduct technical feasibility tests to determine the optimal SoftGum formulation which can be produced using cannabis and hemp ingredients as the filler. CPH will have six months following ASX listing to confirm the intent to manufacture and commercialise the Soft Gum products at which point INNutriGEL and CPH will enter into the final licensing agreement, which will give CPH worldwide exclusivity to use the proprietary SoftGumTM delivery technology with all combinations of phytocannabinoids. CPH has formed a pharmaceutical development agreement with Glatt Pharmaceutical Services from Germany, who will develop highly bioavailable enteric-coated tablets based on the Syloid® XDP Silica technology. Glatt will provide CPH with pharmaceutical product services including product formulation, process development, product testing and clinical supply manufacturing services with access to process technology machines and equipment together with operating personnel. Glatt Pharmaceutical Services is EU-GMP certified and FDA approved to handle controlled substances which means CPH can leverage its technical know-how and ability for its own commercial applications. XDP Silica allows the smooth conversion of oily textures into free-flowing powders that do not lose any potency and have a greater shelf-life. Yet again, the same theme of doing things better, with less waste is clearly visible. Using Glatt’s technology platform, CPH will develop the innovative formulation by mixing the full plant CBD-rich oily extract with the Syloid® XDP Silica to create free flowing powder as the basis for the innovative therapeutic products. For many parts of the world, the current market status for medical cannabis is “Open for Business”. Medical cannabis is a burgeoning market globally. It has been liberated by the removal of strict government or state regulations in many countries, and is already worth US$2.7BN per year, estimated to top $14BN a year by 2020, before reaching $US500BN a year globally once fully mature according to data from ArcView . As you can see, a large part of the Anglo-Saxon world i.e. Canada, UK, US, Australia have all made moves towards legalising medical cannabis, and significantly de-criminalising recreational cannabis use. Therefore it makes sense for CPH to have earmarked Canada and Europe as its two prime target markets. CPH’s operations are based in Switzerland and will be looking at Europe as its prime sales hub. Which brings us to CPH’s other commercial card: Hemp. CPH has acquired 100% of Hemp Industries, a Slovakian company in the business of growing hemp on an industrial scale — this is CPH’s initial cash-generator to assist with ongoing R&D spend. Did you know hemp used to be one of the most recognised, and highest employing industries in the world; used to make paper, clothing, fabrics and even ships? As the medical cannabis market opens up to offer many products to treat illnesses, the parallel hemp industry is likely to also be well-supported. CPH has entered into an agreement to acquire Slovakia based Hemp-Industries . Hemp-Industries has been in business for over three years and owns an existing hemp growing operation with outsourced CBD extraction and product sales activities. Through the strategic acquisition, CPH should be able to generate early revenues and also allow the company to partly source the key ingredients needed to develop its therapeutic products and manufacture them on a large commercial scale. Revenue generation is speculative at this stage and no guarantee to come in, so seek professional financial advice before making an investment decision around this stock. CPH is also following suit with other successful cannabis growers by keeping its entire supply-chain in-house to maximise quality, profits and development. Hemp Industries started selling its CBD oil products in the European market, but over time CPH will seek to expand into other markets where CBD products have been legalised. Considering the embryonic nature of medical cannabis as a commercial industry in its own right, CPH has recruited two very safe pairs of hands, or should we say green thumbs. In fact CPH’s approach at “fusing” the traditional Pharma World with the Medical Cannabis world has brought these two key people and two worlds together. The outcome of this is an injection of pharma’s rigor of methodology and its thrive for high quality and standardization into the emerging Medical Cannabis world. Dr. Miri Halperin Wernli, PhD, MBA Group CEO, Co-Founder and Executive Director is a doyen in the pharmaceutical and biomedical industry with over 25 years of strategic and operational leadership and a deep understanding of drug and product development. It is that experience in Pharma drug development which will no doubt help guide CPH through its current phase and into product development and revenue generation. She certainly knows a thing or two about pharma product development and commercialisation having worked for some of the biggest pharma companies in the world including Merck, Sharp and Dohme, Roche and Actelion pharmaceuticals. Importantly for CPH Dr Halperin Wernli experience covers the full spectrum of areas and activities from Preclinical to Clinical Development and Strategy, to Drug Registration and Launch, across several Therapeutic Areas. 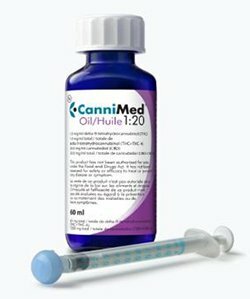 Remember, the medical cannabis and nutraceuticals market is burgeoning, so if somebody with Dr Halperin Wernli’s experience can come along and lead the way in illustrating how development should be done, CPH’s first mover advantage in the nutraceutical therapeutics field will put the company in a strong position as it looks to dominate health environments in Europe, Canada, and Australia in the near and long term. Dr Halperin Wernli’s depth of experience in Pharma drug development as well as her leadership roles in complex highly regulated health environments in Europe and the US make her ideally qualified to lead CPH through this critical initial period of multiple product developments and rapid growth. 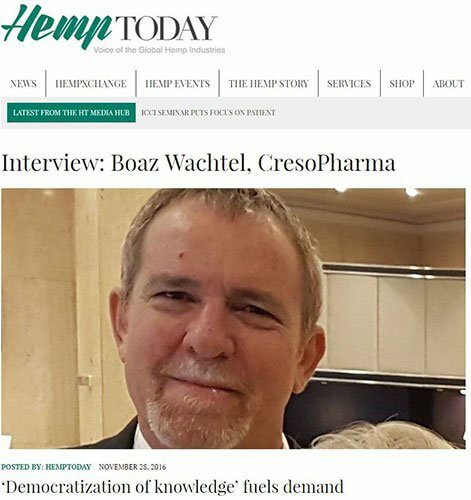 Fellow co-founder and Executive Chairman Boaz Wachtel was a former managing director of Australia’s first publicly traded medical cannabis company, Phytotech Medical. He is a Certified Clinical Manager and earned an MA in Management and Marketing from the University of Maryland. Mr. Wachtel is seen as a pioneer/activist in the medical cannabis field, assisting the Israeli Ministry of Health with the implementation of the National Medical Cannabis Program as well as founding in 1999 the Green Leaf Party – a political party for the legalisation and medicalisation of cannabis. Mr. Wachtel is the also co-founder of the International Medical Cannabis Patient Coalition (IMCPC), whose stated goal is to provide patients safe and legal access to medical cannabis world-wide. A researcher on addiction, harm reduction, and cannabis, he has published more than two dozen articles, papers, and book chapters. He was a founding member of the ‘Israeli Foundation for Drug Law Reform’ (1994) and a public representative to the Knesset (Israeli Parliament) Drug Committee. His long list of credentials and past experience raise the chances of CPH successfully navigating the pitfalls of moving into a new market niche. The projected timeline for newly-listed CPH includes launching its initial human healthcare product in 12 months’ time, followed up by second and third product launches in 18 and 24 months respectively. The first animal healthcare product is expected to be ready within 12 months post listing. CPH’s products are fully patent-protected which ensures CPH will retain all intellectual property rights across the entire value chain. The market for medical cannabis is like a loaded spring that’s been kept down for far too long. 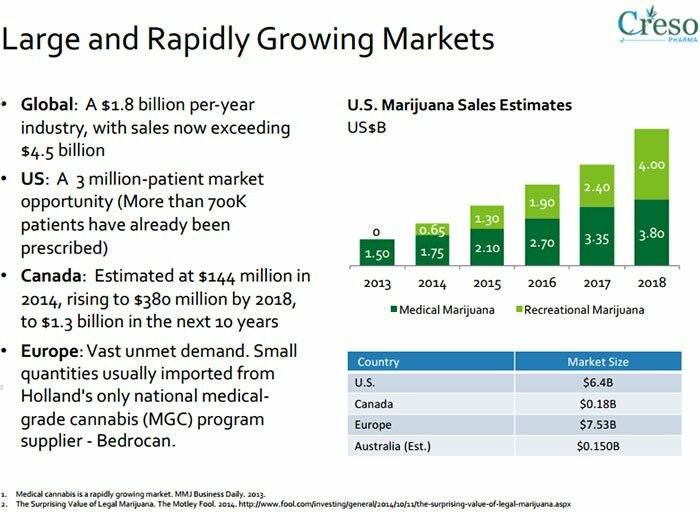 Medical cannabis is already worth $2.7BN per year, estimated to top $14BN a year by 2020, and top out at $US500BN a year globally once fully mature. Now that’s we call a market with spare capacity. CPH wants to have its stall setup and ready before the punters arrive looking for CBD products for themselves and their pets. In human healthcare, CPH has pencilled in full plant pharma-grade CBD rich nutraceuticals delivered in proprietary innovative delivery technologies. For animals, CPH will offer its CBD rich full-plant cannabinoid-based products, formulated specifically for the veterinary market. 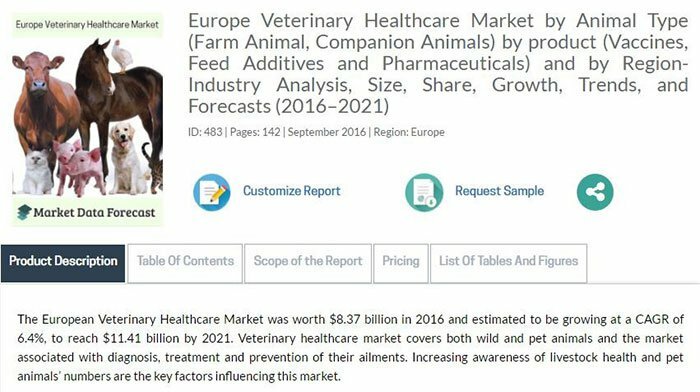 The veterinary market is a key focus point for CPH as there is very little competition which allows CPH to gain a first to market advantage. CPH has put together a timely business that is leveraged to one of the most rapidly expanding market niches out there: medical cannabis and hemp derived products. 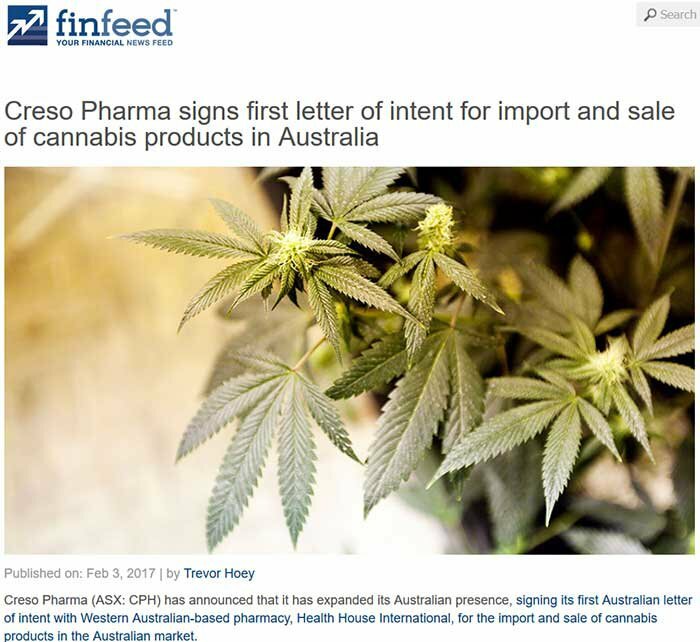 Restrictive government legislation is softening around the globe, including in Australia where history was made just recently with medical cannabis being officially legalised. As government legislation works towards making medical cannabis a new commercial industry, opportunistic medical cannabis companies such as CPH are already moving to capitalise. Working with its eyes on the horizon and its ears to the ground, CPH is now officially ASX listed and going hammer and tongs at getting sales and revenues going. With the ink barely dry on Australia’s historic legislation and plenty of consumers keen to try CBD-based products, CPH has found an early revenue source that should continue to grow alongside CPH’s supplementary ‘hemp’ plans in Slovakia. The attitude towards cannabis is changing, and companies that take an early stake in the development of this new niche could reap substantial windfalls when the mainstream market looks to join the bandwagon over the coming years. Anyone looking for a market sector that has true blue sky potential — medical cannabis... could be it. And CPH is leading the way on a very different path to most who are now taking advantage due to the positive movements in this space.